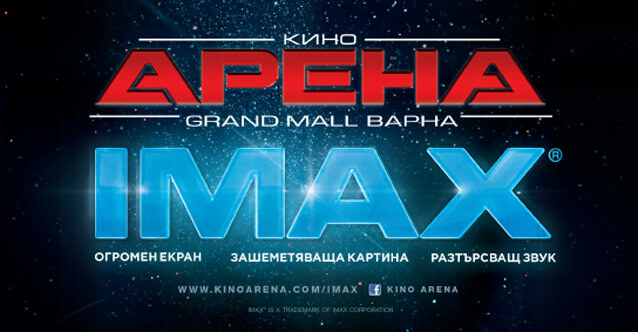 The Kino Arena Grand Mall Varna IMAX® is a stand-alone theater with 423 seats and a super-sized IMAX screen, located on the second floor of the largest shopping center in the city. The theatre incorporates the avant-garde IMAX® projection system, which delivers crystal clear images, with specially designed IMAX® theater geometry, comfortable leather seats and a powerful sound system. All of the technology combined creates an immersive cinema-going experience that makes audiences feel like they are IN the movie - not just watching one. The IMAX® theatre in Varna is the only one in Bulgaria that is equipped with IMAX’s latest 12 channel immersive sound system to provide viewers with the ultimate movie-going experience.